Corfe Bears > Charlie Bears > MINIMO TICKLED PINK 6.5"
She is part of the "NURSERY TIME" SERIES, which also includes LITTLE BOY BLUE. TICKLED PINK MINIMO is one of the bears in a brand new mini series called 'Nursery Time' and this consists of small traditional bears that have been made in delicate pastel colours. Tickled Pink is a little cutie and she is made from a very pale pink blue mohair that is slightly sparse and she has some cream fur on her inner ears and muzzle. The dark eyes have a lovely twinkle and she has a small brown hand-stitched nose and mouth and stitched claws. She also has a few bare patches, which will make you want to pick her up and give her a hug! She is accessorised with a delicate pale cream organza bow and a key pendant that has a jewelled red flower on the top of it, with an aqua centre. 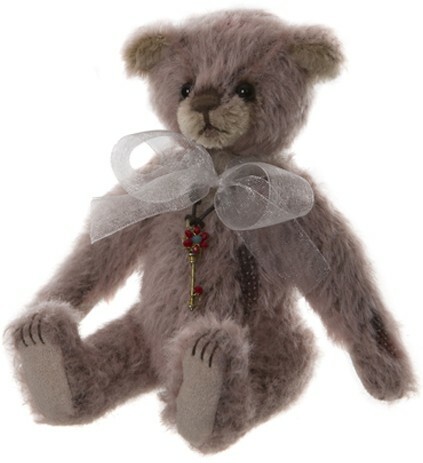 Tickled Pink Minimo is a fully-jointed, miniature mohair bear from the Charlie Bears 2019 Minimo Collection.